Roasted Butternut Squash | Cooking Component | Naturally. When it pertains to vegetarian essentials, roasted butternut squash is key during the winter months. One match of squash can form the basis for endless meals. Of all the things I could share, I realize butternut squash can feel rather boring. But it’s that important.I use butternut squash is almost every way imaginable. 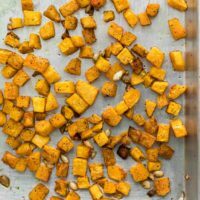 So, I decided to share this butternut squash recipe less for the recipe and more for the inspiration. Once you get a feel for how best to tackle the squash, it only becomes easier. Sure, it takes a little time to peel, cut, and roast. However, this is why I like this as a make-ahead component. Prep the squash on the weekend and use it for a few meals throughout the week. A quick note about peeling: find yourself a good vegetable peeler. I’ve yet to really encounter a squash that my vegetable peeler couldn’t handle. However, if you’re in doubt, a sharp knife will also do the trick. One of the beautiful things about butternut squash is the ability to soak up flavors. This delicious, earthy-sweet flavor works well with all kinds of spices, herbs, and other strong flavors. I’ve found that as long as you like butternut squash’s flavor, it’s hard to go wrong with variations. Herbs: Toss the squash with rosemary, thyme, or oregano. If I’m making simple dish, I’ll stick with the simple rosemary/thyme combination. However, this squash goes well with tarragon, sage, or even basil which is perfect for those late summer/early fall meals. Spices: The easiest way to mix up this recipe, use your favorite spices. 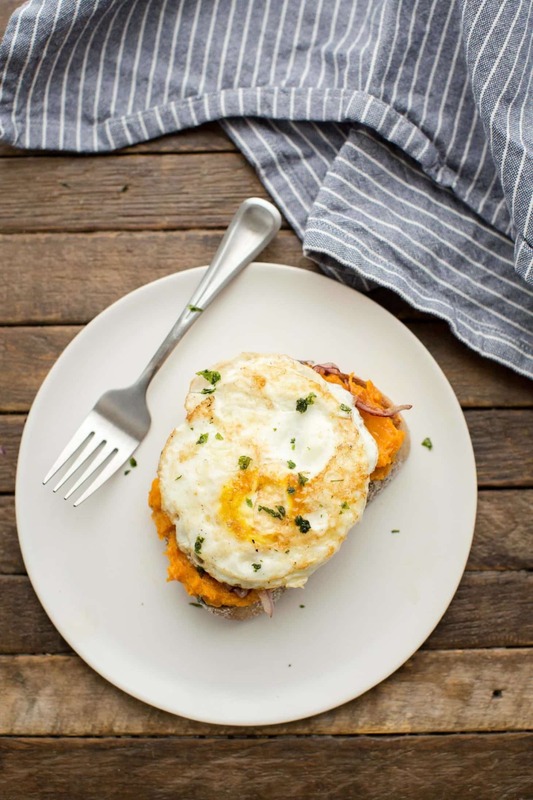 Butternut squash is lovely with many different flavor combinations. Try curry powder, smoked paprika, garlic powder, Ras el Hanout, cumin, chili powder, coriander- I could keep going on and on. The spices you use will depending on what the overall meal. 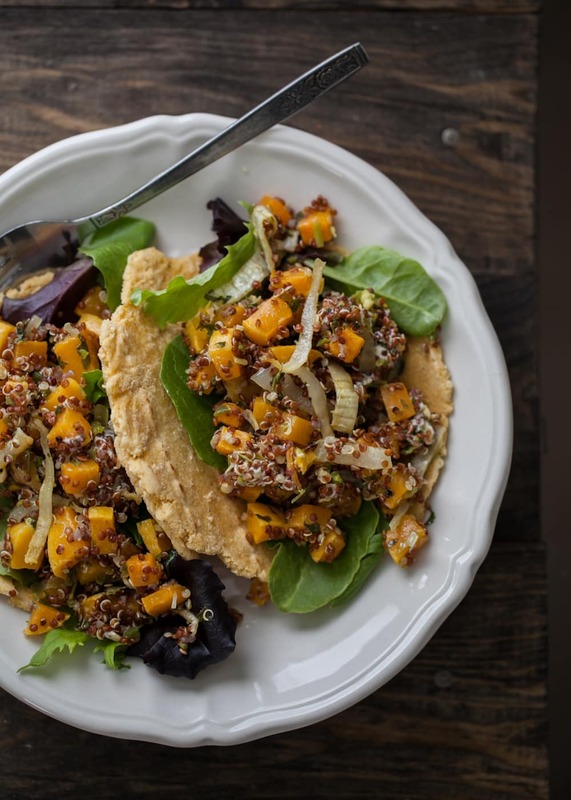 Butternut squash tossed with cumin and chili powder makes for excellent taco filling. Or, if you’re in the mood for a delicious grain bowl, try using berbere or Ras el Hanout. Finally, for some solid all-purpose squash, a combination of garlic powder and smoked paprika is always a win. 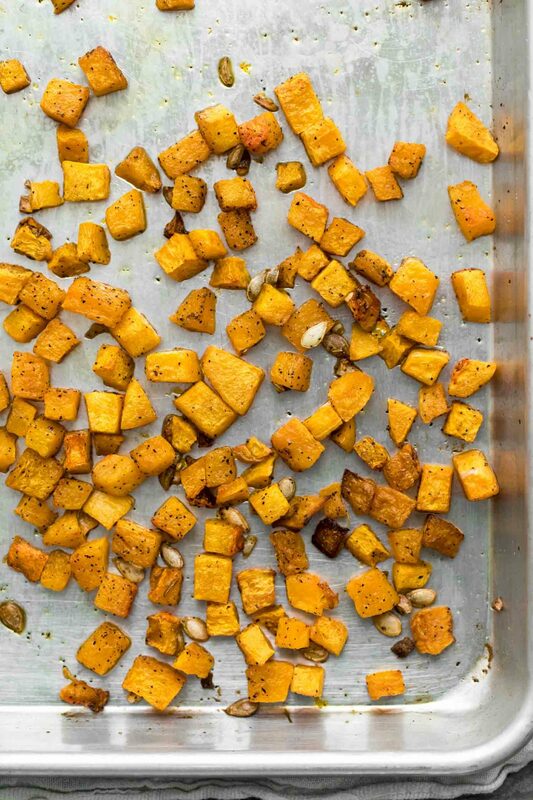 Fats: Skip the olive oil and roast the squash in a bit of melted coconut oil or ghee. Alliums: Add diced onion, shallot, or scallions with or in place of the garlic. Use whatever you might have on hand. Grain Bowls: Use the roasted squash on top of a grain bowl with your favorite sauce. I love these grain bowls with a bit of romesco or chimichurri sauce. Pizza: Toss the roasted squash on a pizza with thinly sliced red onion and smoked mozzarella. If you’re feeling really adventurous, try pureeing the roasted squash and using it as the pizza sauce. Eggs: Use the butternut squash in an omelette, frittata, or quiche. The cooked butternut squash can be tossed in right before cooking (in the case of the frittata or quiche) or right at the end such as in the omelette. Sauce/Soup: Puree the roasted squash with vegetable broth, herbs, and cream (or almond cream) for an easy and delicious soup. 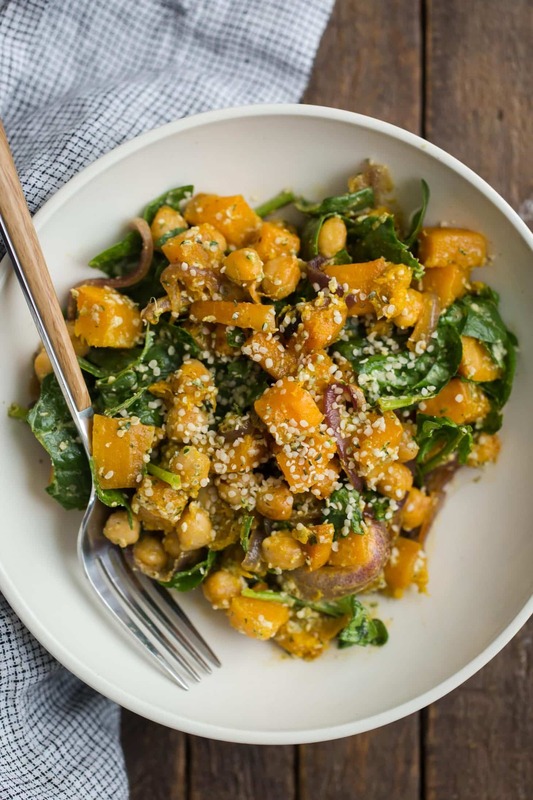 Salad: Add slightly cooled butternut squash to salads with your favorite grains, greens, and dressing. Tacos/Enchiladas: Add the butternut squash to tacos, enchiladas, or tostadas. The butternut squash is perfect when roasted with a bit of cumin, coriander, and smoked paprika. Pasta: Use the roasted squash with pasta and your favorite cream or butter sauce. 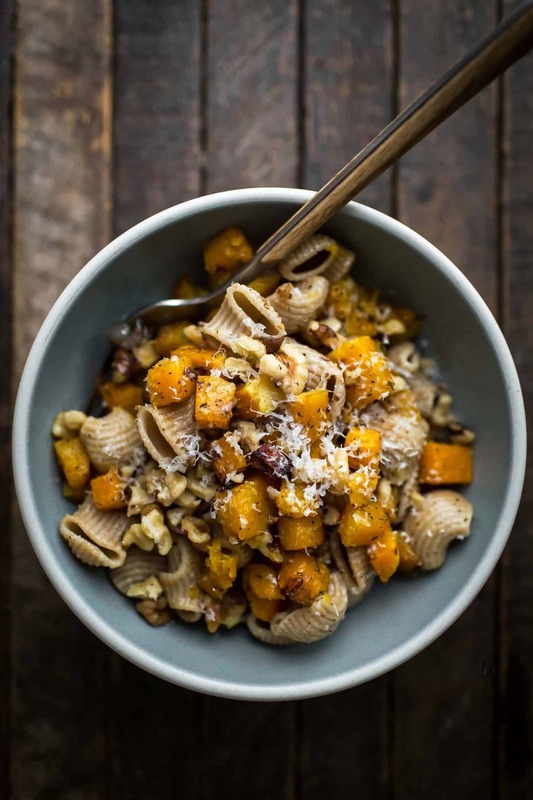 A simple and delicious fall/winter component using cubed butternut squash tossed with olive oil, salt, and garlic. Preheat oven to 400˚F. Peel the squash, using a vegetable peeler or knife, and cut into ½” cubes. Place on a sheet tray and toss with olive oil, garlic, salt, and pepper. Roast, stirring once or twice, until the squash is tender; 30 to 40 minutes. Tips & Tricks: Try this with other squash like delicata, acorn, kuri, or even pumpkin. I am a big fan of component cooking. I just never knew what to call it! I keep a stash in my freezer of prepped ingredients to build my dinners with. So great when you don’t know what’s for dinner and I love the mix and match idea, so I’m not locked into reheating “leftovers”. Will be doing more of this in 2018!